The area covered by East Sussex Fire & Rescue Service (East Sussex Fire Authority) incorporates the County of East Sussex (pop 540,000) and the City of Brighton & Hove (approx pop 270,000). Our community is growing and encompasses a diverse range of people and groups each with differing needs, providing us with a broad range of opportunities and challenges when working both for and with the community. The East Sussex area is divided into 5 local authority areas and we manage these as three Boroughs. From west to east they are Lewes, Wealden & Eastbourne and Rother & Hastings. Each has a different sense of place, culture, demographic and geographic characteristics and therefore each Borough develops its own Plan to ensure cohesive service planning and development, including working with the respective area local partnership groups, local authorities and local community groups. The City of Brighton & Hove, with a resident population of over 270,000, has developed from a small fishing village located where the South Downs meets the sea and the broad coastal plain begins. Development, initially supported by tourism, has grown westwards and northwards until it has been constrained by other boundaries. The City is a Borough in its own right and has its own Plan. Over 70% of our population lives along our coastline, with the remaining 30% distributed in small rural towns and villages northwards to the Surrey and Kent boundaries. There are also differences in population patterns, including such issues as age profiles, gender and patterns of social deprivation. Our area is not best served by motorways or dual carriageways. Most of our traffic is confined to single carriageways networked across our county. In terms of total road traffic collisions attended, there are higher numbers in our rural areas than in our coastal towns and The City where these also tend to be of a more serious nature. We undertake a number of road traffic intervention services including ‘Head On’; ‘Safe Drive Stay Alive’ and other initiatives managed through Sussex Safer Roads Partnership. 12 stations – crewed by retained duty system firefighters who provide 24 hour cover on call and who are alerted to an incident via a paging unit. Wholetime firefighters at Eastbourne crew an Aerial Rescue Pump, a pumping appliance and a national response vehicle 24 hours a day, 7 days a week. 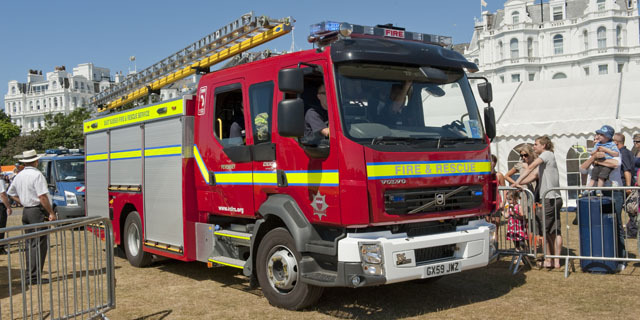 Eastbourne’s pumping appliances cover an area of approximately 3700 hectares covering the seafront hotels. Eastbourne also serves the outlying villages of Jevington, Polegate, Stone Cross, Willingdon, East Dean and parts of Westham. The town has a high number of hotels and guest houses that represent an increased risk during summer months, as does the Victorian pier. To the east of the town there is a large marina complex with its associated risks. Eastbourne’s technical Fire Safety Officers are responsible for ensuring the safety of our community by carrying out fire safety audits of high risk premises, giving fire safety advice and enforcing the Regulatory Reform (Fire Safety) Order 2005. The Community Safety Advisor team concentrate on carrying out home safety visits; however they are becoming increasingly involved in other safety initiatives including providing safety advice at the many community events hosted in Eastbourne including this year’s combined services 999 event.